Police have blocked the Zimbabwe Congress of Trade Unions (ZCTU)'s planned demonstrations against Finance Minister Mthuli Ncube's recent introduction of a 2 percent tax on all electronic transfers by locals. The ZCTU had lined up Thursday protests for Harare, Chinhoyi, Gweru, Bulawayo, Masvingo and Mutare. But police, in a letter sent to the labour based group Tuesday, declared the demostrations will not proceed citing a recent umbrella ban on all public gatherings by government. The ban on public gatherings was imposed ostensibly to try and prevent the further spread of a recent cholera outbreak that has killed nearly 50 citizens. "Therefore, the organisers of the intended demonstrations by ZCTU and its affiliates should take note of government's directive particularly the movement of large numbers of people from one point to another which includes cholera epicenters," read the letter undersigned by police spokesperson Chief Superintendent Paul Nyathi. Nyathi maintained that current efforts to fight the epidemic by local authorities and their stakeholders was still going on. According to indications, he said, chances of contracting the disease were still high among citizens. The ZCTU on Monday vowed it was proceeding with its demonstrations even when Ncube had scrapped the 2 percent levy on transactions of below $10 while also announcing a few other exemptions. But Nyathi, in his letter to the MDC aligned group, warned organisers of the protest they were going to be held responsible for anything that turns "nasty" if they proceeded with the protest. "... Members of the public are accordingly warned that if anything turns nasty, those organising the demonstrations will be held accountable especially with regards to the maintenance of law and order," he added. 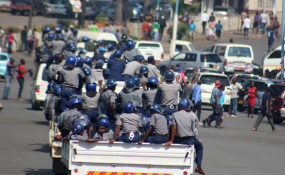 However, ZCTU president, Peter Mutasa rubbished the police ban, saying this was a threat calculated to discourage workers from exercising their constitutionally guaranteed rights. He said the manner with which Nyathi responded showed he was aware the ZRP did not have the legal basis to stop the demonstrations. Mutasa insisted the country's largest labour movement will not stop its preparations for the protest. "It (police) cannot hide behind the cholera matter either. "Every day people are getting in and out of Harare and these are the same people we are calling on. "There won't be any eating as we are poor and cannot afford to prepare meals for the thousands. The attempt to use cholera is therefore completely irrational," argued Mutasa. The ZCTU chief said his organisation was preparing to file an urgent chamber application challenging the ban and warned the ZRP against withdrawing constitutionally given rights. "The police should also not be allowed to threaten citizens with unspecified action for exercising their rights to demonstrate and petition especially on such a serious matter affecting the public. "We are weighing our options but we will consider taking the legal route in addition to other measures we will advise soon," he added. The ban on the labour group's demonstrations follows similar prohibitions the state has imposed on MDC leader Nelson Chamisa's rallies.